1. Discuss what role the father’s death plays in the novel. How has it affected Ellen, Morris, and Bonnie differently? 2. When Bonnie’s letter arrives, Ellen’s first reaction is “what to do,” and Morris’s is “what to think.” Discuss their differing responses. 3. Why is Bonnie still so unformed? Why doesn’t she feel anchored? Has she saved herself by marrying Pastor? Has she substituted God for drugs and medication? 4. Is it surprising to meet Pastor’s parents? What is Rex’s take on Morris? On Bonnie? On Pastor? 5. Ellen is the peacemaker in the family -- she has a tendency to rescue others and to try to protect other people’s feelings. How does the novel illuminate her role in the family? 6. What memories does Ellen have of her mother? 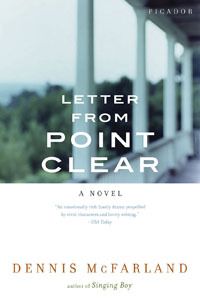 How does the visit to Point Clear affect her relationship to her mother? 7. At the dinner party, Bobby mentions a story by Eudora Welty, “A Memory,” about the loss of a young girl’s innocence. Does this story resonate with the characters in the novel? If so, how? 8. To what degree does this dinner scene reveal the author’s views about traditional Christianity? How fairly does the author treat Pastor during this scene and throughout the novel? 9. Given the portrait of Bonnie in Chapter 4, is it surprising that later she sides with her siblings against her husband? Why doesn’t she try harder to support Pastor? Discuss her wavering allegiances over the course of the story. 10. Pastor thinks Bonnie will “settle back down” after her siblings leave and that their marriage will return to “normal.” What do you think? 11. When Pastor tries to get support from Macy regarding his discomfort with Morris’s homosexuality, what is the result? Discuss Macy’s response and how it affects Pastor. 12. When they return to Massachusetts, why don’t Ellen and Morris tell their spouses about Pastor’s mystical experience and subsequent breakdown? 13. Do Ellen and Morris get what they expect from their trip to Point Clear? What has changed for each of them? 14. Discuss forgiveness and compassion as themes of the novel.